We are staying on track with our "cook around the world" plan for this year. Our second country was Colombia. 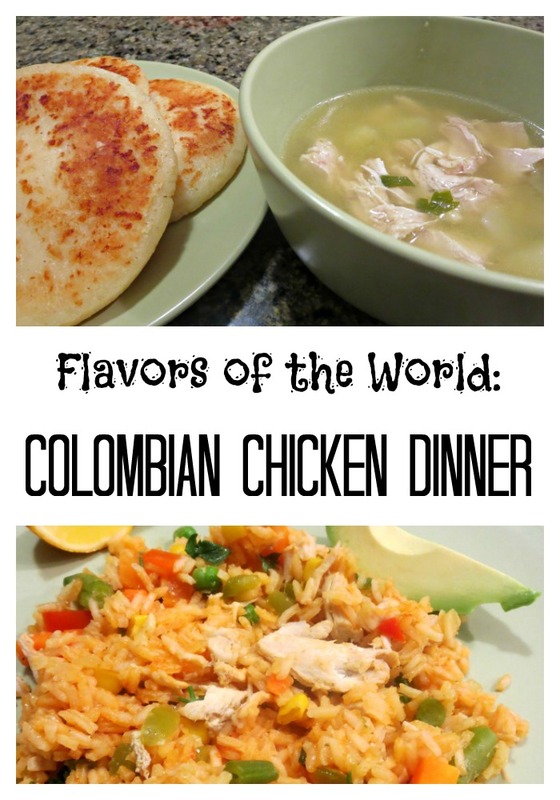 Yet again, we made a unit study for Colombia and tried two different dishes that had chicken as a main ingredient - Colombian chicken with rice (arroz con pollo) and chicken and potatoes broth (caldo de pollo con papa). While reading about Colombian cuisine, we learned that the most traditional Colombian dish is called Bandeja Paisa, and it's a big mix of various grilled meats, rice, beans, and fried eggs. I was tempted momentarily, but this seemed just way too much food for our small family. In the end, I went with much less ambitious choices. 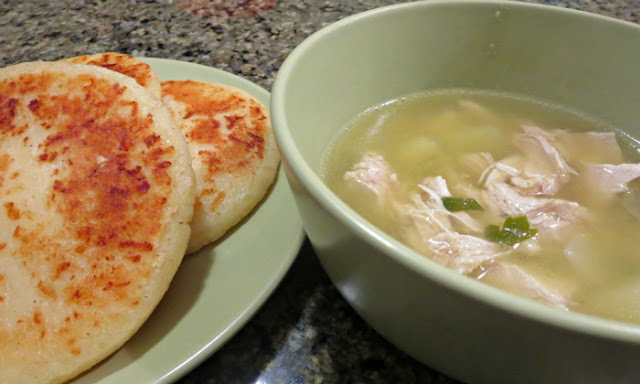 On the first day, we made Arroz Con Pollo and on the second day, since I had some broth to reuse, we made chicken potato soup with cornmeal bread called arepas. I was not brave enough to make arepas and bought them in a local Colombian bakery. Unfortunately, I could not find Goya seasoning required for this recipe in our local supermarket, so I tried to replace it by Vegeta. Also, I used a frozen vegetable mix that I already had on hand, so our veggie mix was a little different from the recipe and included corn. 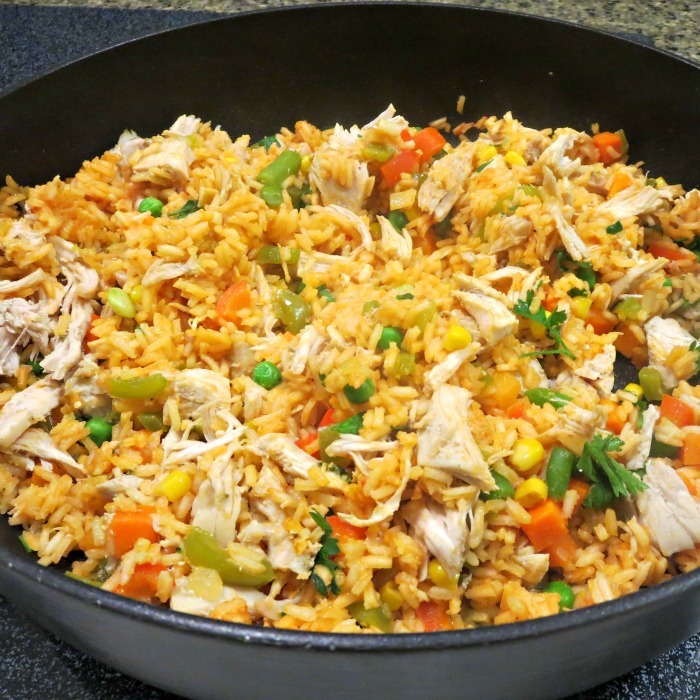 I followed the rest of the recipe exactly as described on My Colombian Recipes site. 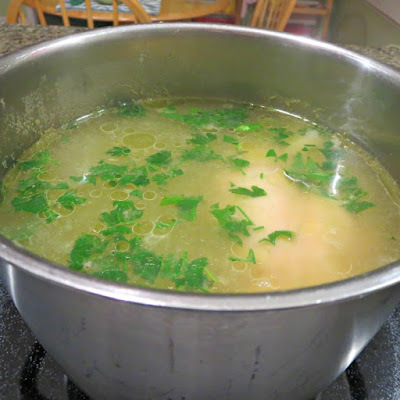 I halved the recipe for our small family and combined remaining chicken broth from chicken and rice dish, one can of low sodium chicken broth, and some water for stock. The smell was delicious when the soup cooked. I really liked the soup, but... we already have a chicken soup and a potato soup in our rotation, and my family's verdict was that they prefer family versions for both. My husband especially was not a big fan of putting potatoes in the chicken soup. We all agreed that the rice dish was somewhat dry - we are more used to the dishes that have some sort of sauce to go with it. It also was somewhat lacking in flavor - perhaps because I could not find Goya seasoning. Overall, it was an interesting dinner, but next time we want to try Colombian dish, we will probably go to our local Colombian cafe, which Smarty really enjoyed. More Flavors of the World? I really like your 'cook around the world' idea! 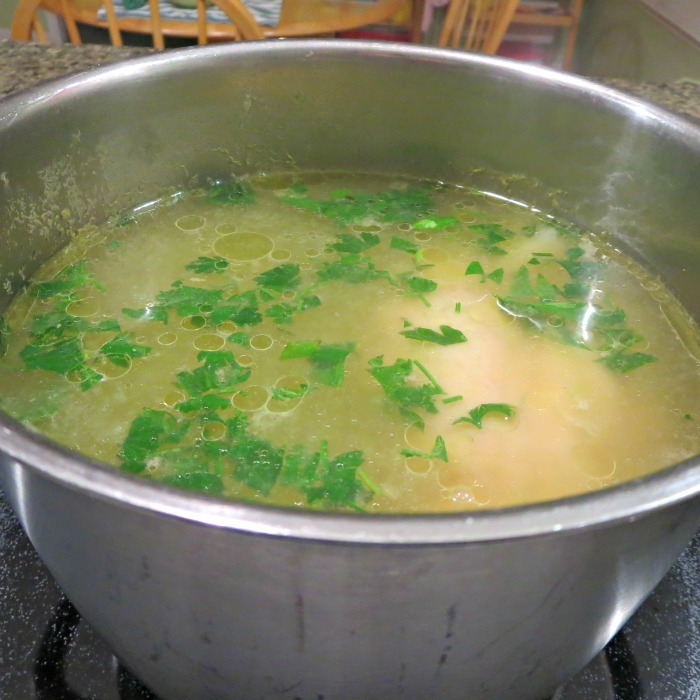 I've always been intrigued and amused to find the wide number of cultures that have some variation on a chicken soup recipe. It shouldn't surprise me because soup and chicken are two of the most common foods, but it's still interesting. Having the right spices can make a big difference! I agree with your husband on potatoes in chicken soup - not my favorite texture combination.